Quad-core processor provides fast and fast browsing experience. Users can download countless applications from the Google Play Store by connecting Tablet to WIFI. With built-in speaker, microphone, front camera for video chatting and rear-view camera for taking pictures. This is kid-friendly interface tablet, Android 7.0 preinstalled with Google Play Store, users can access millions of children's applications, education, videos, books, games, etc. By building parental controls, parents can manage apps and time by setting multiplication formulas or PIN codes. Parents can choose the sites they want to share with their child, block and monitor specific apps and websites, and set how much time a child can play on the tablet. This parental control is easy to set up and change. 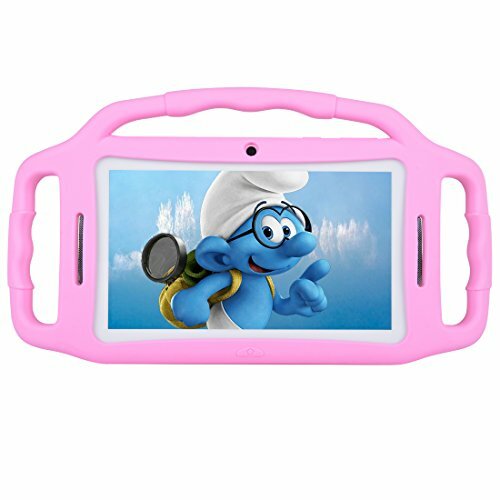 This children's tablet allow a few or a few children share the tablet, parents can create profile for each child. In this way, parents can ensure an age-appropriate experience for all. Full featured 7 inch HD display, 1GB RAM+8GB ROM. It can expand to 32GB with a TF card. Dual Cameras, Front and rear cameras, easy video chatting. Long Standby,Best tablet both for kids and parents--with Kid Mode pre-installed, there's no need to worry about unfriendly content on the Internet. With a Quad Core CPU, it delivers the perfect mix of power, portability, and performance. You will get an all-in-one powerful device. Latest Android 7.1, preinstalled kid-friendly interface with Google Play Store, you can download countless popular apps and games, videos, eBooks and learning content by connecting the device to WIFI. Great for kids--With Kid Mode, kids can have their own personal playground and Children Friendly Interface makes it easy to use. They can get access to fun and educational games and videos which you choose for them. All the content in BENEVE TABLET adapts to your child's age and skill level. So they are always playing and learning at the highest level. Kid-Proof Case--Durable, lightweight case to protect against drops and bumps caused by kids while playing. Made of high quality soft silicone material, the bundled case is environment-friendly and harmless to health. No need to worry about any potential harm. The soft material brings soft and smooth touch experience.